Continuity, mutual trust and confidence are the major pillars of India-Russia relations or the basis of solid background of Indo-Soviet ties. The bilateral relationship has developed into a strong “strategic partnership” in recent years. One important point of the old Indo-Soviet friendship was a special bilateral trade and economic relationship. Although this arrangement had the usual weaknesses of corruption, patronage, transactions in low quality products, it helped many small and medium size private companies to become exporters. After the disintegration of the Soviet Union, this relationship has been badly damaged. Economic transformation in Russia from a centrally planned economy to a market economy in 1992 – coined as the policy of economic liberalization in India. These developments changed the nature and character of foreign economic relations in both the countries. Therefore, despite having solid economic and trade relations in the past, a large part of the 1990s was a period of difficult adjustments for both Indian as well as Russian business. When India attained independence, the Cold War had already begun; the world had almost become bi-polar. The United States and the former Soviet Union had emerged as super powers who led the two power blocs. India having decided to remain non-aligned, was looked upon with skepticism more by the Soviet Union than by the western bloc. However, pre-independence India had favorably disposed towards the Soviet Union ever since. Nehru was greatly impressed not only by the Russian Revolution of 1917, but also by the planned economic development brought about in the Soviet Union in accordance with the socialist ideology. Nehru had visited the USSR in 1927. He was head of the foreign department of congress. Indian leadership was quite appreciative of the Soviet support to the cause of India’s freedom. Nehru had tried, soon after independence, to develop friendly relationship had its roots: on the one hand in struggle against western imperialism and colonialism and on the other hand in India’s national interest. This growing friendship was also marked as the Soviet’s attempt to spread communist ideology in South Asia by the USA and its allies. After India’s independence, the relations between India and the Soviet Union could not develop along the lines envisaged by Nehru. Certain tensions appeared in the ties largely because of Stalin’s rigid approach implying that all those who were not communists were against Soviet Russia just after India’s independence. India’s decision to remain a member of the Commonwealth Nations even after becoming a republic, created new irritation for the USSR. India’s decision to adopt the Non-Alignment policy, India’s opposition to pro-Soviet developments in Malaya, and India’s support to Greece against possible communist expansion also made Stalin unhappy. Therefore, India made consistent effort to clear the misunderstandings between two nations. However, India was among the first few nations to have recognized the People’s Republic of China on December 30, 1949 within the three months of the completion of communist revolution. After that, a trade agreement was concluded between India and Soviet Russia in 1949 itself. Again, the adoption of free and fearless policy by India in the Korean War led Stalin to praise and appreciate India’s position. Since then, improvement in Indo-Soviet relations were clearly visible. After the death of Stalin, Nikita Khurschev became the head of the Soviet Union and in his tenure Indo-Soviet relations took a new turn. In April 1954, India-China took the famous five principles of Panchaseel as basis of their bilateral relations. The principles of peaceful co-existence highly appreciated all over the world and when Indian PM Nehru paid a visit to USSR in June 1955 the USSR impressed with principles and appreciated India. It was the Soviet Russia which opposed sending foreign forces to Kashmir when the Kashmir issue came up. Afterwards, both the nations, India-USSR adopted the identical position on the Suez crisis in 1956 & condemned on the Anglo- French- Isreal aggression against Egypt. In 1956, some misunderstanding came up in the ties of both the nations on the question of Hungary & again in 1962, when China waged a war on India’s border, Soviet attitude was not very sympathetic to India. But during the Indo-Pak war of 1965 Soviet Russia was not only supported to India while US provided their support to Pakistan, also took the initiative to arranging ceasefire through security council & later sponsored an Indo-Pak submit in its own territory at Tashkent in Jan 1966. After this, the Bangladesh crisis of 1971 was also brought India & USSR to closer by signing a treaty of Peace, Friendship & Cooperation was signed by the both the nations on Aug 9 of 1971, while India left with no alternative but to seek the help of the USSR when Pakistan to wage a war, was preparing for it. But many critiques put the remarks as India had given up its non-alignment policy & moved into Soviet bloc. Soon after the Bangaladesh’s war of independence India faced the black days of emergency & after the emergency Indira Gandhi defeated in the election & first non-congress government Janata Party Government came into the power under the Prime Ministership of Moraraji Desai in 1977. During that period, Indian PM Desai & Soviet President Brezhnav emphasized Indo-Soviet cooperation on the basis of peace, internal security & peaceful co-existence & some agreement was also concluded between both the nations. Meanwhile, the environment was suddenly changed & it affected by the new cold war as result Soviet intervention in Afghanistan in 1979 brought back the threaten & question mark for India’s friendly relation with Soviet in the mean time Soviet intervention over Afghan regime was described as painful. However, after the fall of Janata Government, Indira Gandhi came back to power in Jan 1980. The soft line adopted by her was strongly criticized as compromise with the policy of non-alignment & clear shift towards to the Soviet Union. Indo-Soviet relations were further consolidated during the period that the two nations were led by Rajiv Gandhi & Gorbachev. The two nations had more or less identical views on most of the international questions. Therefore, the Indo-Soviet friendship would be maintained at high level. During 1990-91, India generally supported the position taken by the Soviet Union in the Gulf Crisis. Soon after, during the period of crisis in the USSR, the Soviet was seen unhappy when India was commenting that overthrowing of Gorbachev government by the hardliners was the internal matter of that country. When the coup failed & Gorbachev came to power, India faced a very embarrassing situation. After that Soviet Union suddenly collapsed in Dec 1991 and as a result 15 new states emerged in world map. But India has maintained friendly & cooperation relations not only with Russian Federation but also the other newly emerged states. After the breakdown of Soviet Russia, Russia seeking friendship with the western bloc & as well as non-aligned group. Russia & India pledged to cooperate with each other in political & economic fields & Russia agreed to continue with the supply of spare parts for Indian defense equipments. After the end of the cold war, India would need for a long time to come Russian Technology & machinery , & Russia would have to import several consumer goods from India. During the period of 1994-96 several high level visits were exchanged between the two countries & agreed to take necessary measures to remove the bottlenecks in the bilateral trade. The relations between both the nations for the first time in the post-cold war period poised for the revival of the traditional Indo-soviet friendship, even as Russia would like to move closer to the US also. Again, the friendship was clearly evident during & after Kargil War, where since the beginning Russia firmly supported to India. Beside, strategic partnership, trade & cultural cooperation, the two nations also joined hand to fight against terrorism. In Dec 2002, the commitment to expand nuclear cooperation with India by selling additional nuclear reactors also marked as the Russian obligation in the nuclear field. The main pillars of Indo-Russian relationship established under Dr. Monmohan Singh in between 2004 to 2014 are strategic congruence, defence ties, nuclear power, trade and hydrocarbons. The long-term geopolitical interests of both Moscow and New Delhi are also compatible. The former’s non-intrusive approach in sub-continental affairs, which acknowledges and respects India’s sovereignty, is especially valued in New Delhi. Here it is important to put, after the Ukraine crisis in 2014, the Russia-China relationship has become stronger, with important implications for India & other rising powers. Both Russia & China are being challenged by the United States, politically, economically, & strategically. That also caused for some worries for India. Also, the policy to move towards USA was started way before Modi came into picture is brought some difficulties in the relation between the nations. 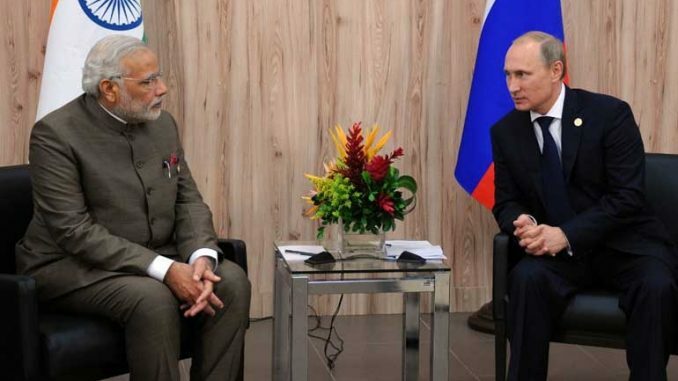 Russia-India trade has not grown to great heights despite the encouragement of both states. India has been supportive of Russian positions & has a careful & calibrated response to all Russian actions — in Chechnya, Syria, Ukraine & elsewhere, India has supported Russia. To fight against terrorism is another area where Modi & Putin found a convergence of interest. To conclude, the warmth in Indo-Russian relations has been maintained & sustained. Trade between two countries continued to grow. Russia stands firmly with India in its fights against terrorism. Both sides also emphasized the need for comprehensive reform in UN system. They are also good allies in BRICS nations submit. Somehow, at present time in the age of ease of doing business India’s changing narrative towards US makes some hazards but India-Russia relations have its roots, on the one hand in the struggle against western Imperialism & colonialism & other hand in India’s national interest. Where, India’s relation with Russia is highly symbiotic.